Rtas 'Vadum: "Then it is an even fight... All cruisers, fire at will! Burn their mongrel hides!" The Fleet of Retribution was a naval formation composed of ships under Sangheili command that broke off from the Second Fleet of Homogeneous Clarity when the Great Schism began. The fleet was led by former Special Operations Commander Rtas 'Vadum, with Shadow of Intent serving as the flagship. The Fleet of Retribution was the only known group within the Covenant separatists to ally with the UNSC during the Great Schism. The fleet briefly took in forces from the UNSC Seventh Fleet during the final days of the Human-Covenant War. During the joint assault on the Forerunner Installation 00, the fleet played an instrumental role in bringing about the Covenant's defeat. After the war, a large portion of this fleet's personnel and naval components would be incorporated into the Swords of Sanghelios. Arbiter Thel 'Vadam, future leader of Sanghelios, served as a field commander in the fleet. 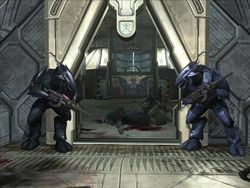 Other notable figures serving with Retribution include Commander Miranda Keyes, Spartan and Master Chief Petty Officer John-117, and Sergeant Major Avery Johnson. The Sangheili ships shortly after the fall of High Charity. During the Battle of Installation 05, the Second Fleet of Homogeneous Clarity was split in two. Sangheili-controlled ships and those under Jiralhanae leadership began to open fire on each other over High Charity. The Sangheili-controlled remnants of this fleet, which did not either heed Imperial Admiral Xytan 'Jar Wattinree's summons at Joyous Exultation or scatter elsewhere, were reformed into the Fleet of Retribution. The newly-formed fleet came under the command of Shipmaster Rtas 'Vadum. Many Covenant species in proximity to the Sangheili remained loyal to them during the conflict, notably the Unggoy and the Mgalekgolo. On Installation 05, Arbiter Thel 'Vadam had formed an alliance with Sergeant Avery Johnson in order to stop Tartarus from activating it. This alliance shortly carried over to the rest of the Fleet of Retribution. The Sangheili forces eventually triumphed at the Halo installation and also blockaded the ringworld to prevent the Flood from escaping. However, a Flood-controlled vessel, Indulgence of Conviction, evaded the blockade and headed for Earth. The fleet chased after that ship. It arrived on Earth during the closing stages of the Battle of Voi, soon after the Flood-controlled battlecruiser. However, one assault carrier did not arrive on Earth for unspecified reasons, leaving the Shadow of Intent as the sole flagship of the fleet. Infantry from the Fleet of Retribution during the Battle of the Citadel. After Spartan John-117 recovered a pre-recorded message from Cortana, Shipmaster 'Vadum ordered the fleet to glass the area immediately surrounding Voi to prevent the parasite from spreading further, much to the dismay of Fleet Admiral Terrence Hood. 'Vadum then attended an assembly on his flagship's bridge, wherein it was decided that a joint human-Sangheili force would pursue the Prophet of Truth's fleet through the slipspace portal that had recently been opened. Subsequently, the Fleet of Retribution, along with the UNSC frigate Forward Unto Dawn, engaged the Prophet of Truth's forces at Installation 00. Confronted with an enemy which outnumbered them three to one, the Fleet of Retribution nevertheless succeeded in destroying the Covenant's orbital forces, assisting the UNSC on the surface of the Ark. The surviving members of the Fleet of Retribution and human forces evacuated Installation 00, leaving Truth's remaining forces to their doom. Only Shadow of Intent and Pious Inquisitor are known to have survived the Battle of Installation 00, though it is possible that other vessels remained intact. After the Sangheili were victorious in destroying the Covenant, they split off into several different factions. Similarly, the Fleet of Retribution splintered, with many of its members joining the Arbiter's emerging Swords of Sanghelios, which would become the official government of Sanghelios. However, some members of the fleet left, choosing to join other Sangheili factions instead. These few Sangheili wanted to take control over what was left of the former Covenant that they had destroyed; some joined Jul 'Mdama's Covenant while others consolidated into smaller independent factions. The Shadow of Intent, the former flagship for the Fleet of Retribution, was involved in a battle on the Sangheili colony of Rahnelo. The San'Shyuum Prelate Tem'Bhetek set a trap for Rtas 'Vadum and the Shadow of Intent. Many lives were lost and the Kaidon and two of his sons were taken hostage. 'Vadam with the Special Warfare Group. Preventing a further Flood outbreak, battlecruisers glassed Voi. Retribution traversing through the Portal to the Ark. Lord Hood's Pelican is in the foreground. Force Recon Marines assault an anti-aircraft emplacement. Two sections of Retribution dropships. ↑ Halo Waypoint: Canon Fodder - Lore of the Rings "Like the rest of the Sangheili, the surviving Councilors were not completely unified in their opinions on how to proceed following the Great Schism. While some did take up the Arbiter’s cause, many others had become enamored with the idea of bringing the Covenant empire under complete Sangheili rule, quickly scrambling to grab power wherever they could. Some of these eventually served under Jul ‘Mdama, while others consolidated small pockets of reclaimed Covenant assets under more independent factions."